As I mentioned yesterday I have been doing a bit of domestic running around on Qantas and after what seems like forever I finally had an opportunity to fly on one of Qantas' latest Boeing 737-800's featuring Boeing's new Sky Interior. In case you don't already know the BSI makes the 737 a much nicer aircraft to fly in. The windows are the same size physically but the shape of the surrounds are an oval shape to allow more light and make the window seem larger. The overhead storage is shaped like those found on the Boeing 787 meaning more head room but increased storage space and the roof has an interesting new shape with LED lights that change colour during different phases of the flight. 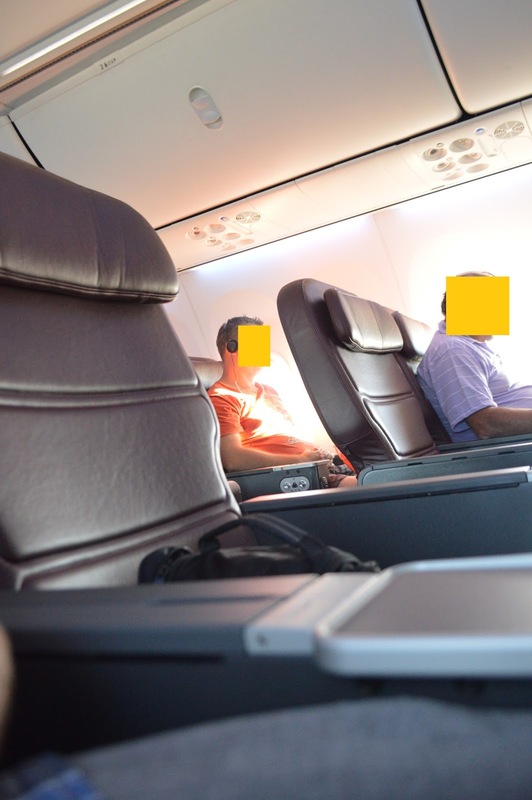 As well as all this Qantas has a new seat in business class, essentially it is the same as the A380 premium economy seat but it's covered in leather. I found it a nice improvement over the old seat. Row 1 is particularly nice as there is nobody reclining into your space and you can comfortably get up to go to the bathroom even if the seat beside you is occupied. All seats on the aircraft including those in economy feature PTV's. In business row 1 the TV comes out of the arm rest. You can see in the photo above the controller is also attached to the front of the armrest, in a nice out of the way location. The screens are touch screens so there is no real need to use the controller anyway. The service on board was again good, I find Qantas business fairly consistent in their service delivery. Being an early flight it was breakfast and a quiche was offered with beans and spinach. It came with croissant and fruit salad. Taste was pretty good. We arrived at Brisbane on time and I have to say whilst I am not a huge fan of the Boeing 737 (I prefer the extra width on the A320 cabin), I am a fan of this new BSI interior and the Qantas seats. Sure they are not lie flat beds but they are perfectly comfortable for the routes they usually fly of 1 to 3 hours in duration. I'm going to be hoping for this interior on my upcoming Qantas flights next month! Great review I have been dying to see the BSI in one of your reviews! Will you try the QF a380 on the QF EK deal???? Your great at doing reviews! Have you see the new QF uniform?? ?